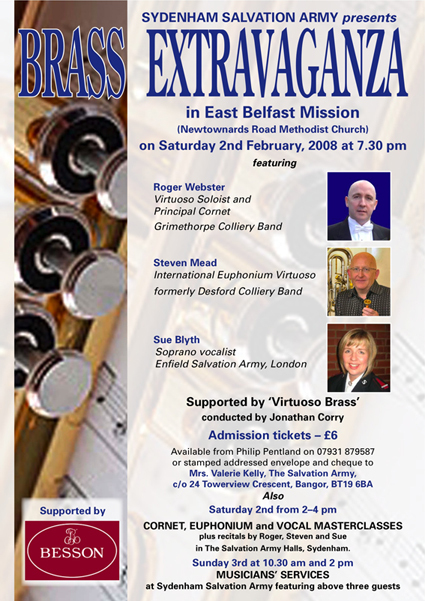 Its been few years since Steven has played in Northern Ireland so it is with great pleasure that we can announce that he will return with Roger Webster (cornet) on Saturday 2nd February 2008 for a spectacular concert in Belfast with a specially assembled allstar band conducted by Jonathan Corry. There will also be masterclasses on the same day, Saturday 2nd February from 2.00 - 4.00 pm plus recitals by Roger, Steven and vocalist Sue Blyth in The Salvation Army Halls, Sydenham, Belfast. Steve, Roger and Sue will also be performing at the services the following day at 10.30 am and 2.00 pm at Sydenham Salvation Army.